Elements Automated Data Integration Enables Marketers to Quickly Act on the Wealth of "Big Data"
LOS ANGELES, CA--(Marketwire - Feb 26, 2013) - Campaigner®, the sales and marketing brand of j2 Global, Inc. (NASDAQ: JCOM) that empowers companies to better attract and retain business through creative email marketing campaigns, today announced the launch of Campaigner Elements™. Campaigner Elements is a new and improved API for Campaigner Email Marketing that allows marketers to integrate systems and analyze "big data" to gain visibility into subscriber behavior. Flexible, powerful and easy to use, the API helps marketers drive more business from their email marketing. Campaigner Elements gives marketers the ability to integrate information from different systems to capture, analyze, report and then act upon the information they collect. Marketers will be able to seize opportunities more quickly by using custom applications to create and send tests, full-blown campaigns and workflows from anywhere. The powerful new API provides valuable list, contact, campaign and content management features and more than 600 pre-built email templates. Campaigner Elements provides a simple, yet powerful solution for marketers who want to target their customers in a more effective way while saving time and money. With a high level of importance placed on analyzing the "big data" that results from recipient email activities and behaviors such as opens and clicks, Campaigner Elements allows marketers to better identify and serve customers and customer targets in their email marketing campaigns by gaining insight into their behaviors, likes, dislikes and buying patterns. "The Campaigner Elements API has been very effective and flexible for me considering our constantly evolving software requirements, specifically because of the extensive functionality available for me to integrate into my software," says Marc David, owner of Wildchild Nation. "Having access to Big Data through Campaigner's API has provided me the ability to analyze customer behavior and enabled me to communicate and interact with my customers in a more personalized and effective way." Campaigner Elements uses standards-based protocols, which allows developers the flexibility to use any programming language. It is fully scalable and supports integration with a diversity of platforms and technologies, including third-party databases and applications, CRMs, websites, and social networking content. Campaigner Elements custom enterprise pricing is available for volume senders and larger customers looking for API integration. Campaigner is also available today for small businesses starting at $10 per month subscriptions. 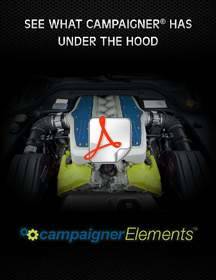 For more information about Campaigner Elements and its features, please click here. For additional supporting collateral on Campaigner Elements please download a PDF here. j2 Global, Inc. (NASDAQ: JCOM) provides Internet services through its two divisions: Business Cloud Services and Digital Media. The Business Cloud Services Division offers Internet fax, virtual phone, hosted email, email marketing, online backup, unified communications and CRM solutions. It markets its services principally under the brand names eFax®, eVoice®, FuseMail®, Campaigner®, CampaignerCRM™, KeepItSafe®, and Onebox® and operates a messaging network spanning 49 countries on six continents. The Digital Media Division, created with j2 Global's November 2012 acquisition of Ziff Davis, Inc., offers trusted news and reviews of technology products on its web properties, which include PCMag.com, ExtremeTech.com, ComputerShopper.com, Toolbox.com and Geek.com. The Digital Media Division also operates BuyerBase®, an advanced ad-targeting platform; LogicBuy.com, a leading provider of online deals; and Ziff Davis B2B, a leading provider of research to enterprise buyers and leads to IT vendors. As of December 31, 2012, j2 Global had achieved 17 consecutive fiscal years of revenue growth. For more information about j2 Global, please visit http://www.j2global.com.